A Photo Collage is a great way to incorporate a group of your most cherished photos. Each photo is enhanced by our artists and artistically arranged to create a beautiful display. A great option when you can’t decide on a single photo. Whether your Photo Collage features pictures of your subject growing from child to adult, a mashup of their favorite vacations, or a combination of their best family photos, it’s sure to add character, personality, and beauty to your service. Custom backgrounds can be created upon request. 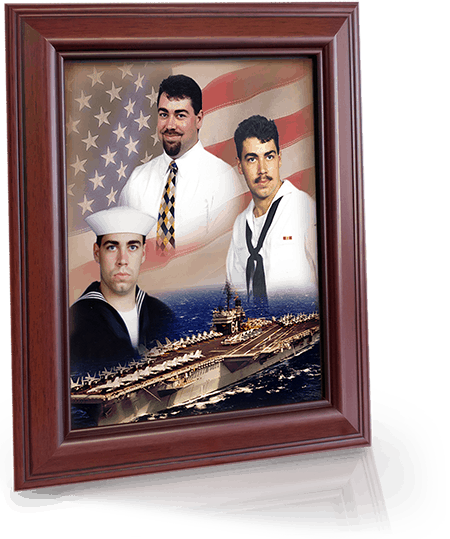 Delivering Memory Portraits to the Lone Survivor, Marcus Luttrell and his brother, Morgan. It was their birthday and we were able to surprise them and honor them! A very special thank you to the staff at Memory Portraits. You guys are amazing! You touch so many lives every single day!